Thomas Power O’Connor’s election to the House of Commons as an Irish Parliamentary Party MP in 1885 was not unusual. He was one of 86 Irish nationalists elected that year, a strong result that built on the 63 Home Rulers elected in 1880. What was unusual was that O’Connor represented a constituency in England. He had also been voted in by the electors in an Irish constituency. And, to add to the confusion, his seat in England was the Merseyside constituency of Liverpool Scotland (so called as it was centred on Scotland Road). T P O’Connor (also known by his initials as Tay Pay) had been elected as an MP for Galway in Ireland on a Home Rule platform in 1880. In 1885 he stood for both Galway and Liverpool Scotland, and was returned by both. He opted to take his seat as the representative for Liverpool Scotland, and Galway was then represented by a succession of Irish Parliamentary Party MPs. Most notable of these was his immediate successor, Captain William O’Shea, whose divorce proceedings in 1890 (on grounds of his wife’s adultorous affair with the Irish Parliamentary Party leader Charles Stuart Parnell) would divide the loyalties of the Irish block sitting in the House of Commons and taint Parnell’s reputation in Ireland. 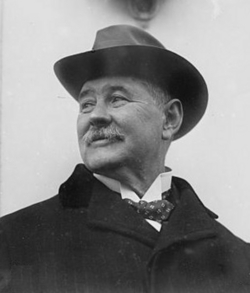 T P O’Connor would remain as the only Irish Nationalist MP in Great Britain, and retained his seat long after Ireland secured independence in 1921. His seat only became vacant on his death in 1929, when it was taken up by David Logan. Logan was heavily involved in the Irish Nationalist movement, and had represented the party on Liverpool City Council. By the time of his 1929 election he, however, joined the Labour Party and therefore left his mentor O’Connor his position in the history books as the only Irish Nationalist MP in Britain.